You will feel the peace and security of working with a trusted Medicare insurance advisor. Your Medicare insurance plan will be tailored to your unique needs and preferences. We are completely independent and work with all the carriers and plan types in San Diego. This allows us to present you with all options that are available. Medicare can be very confusing, I am here to help you understand your options so you don’t have to waste time sorting through all that mail and brochures! I am an independent broker specializing in Medicare plans in San Diego. I am contracting and certified with ALL Medicare insurance carriers and plan types in San Diego. I work with people all over San Diego County. As an independent broker, I am able to provide 100% unbiased information to my clients. Because everyone has different needs, our mission is to make sure each client has the best plan for THEIR specific needs. 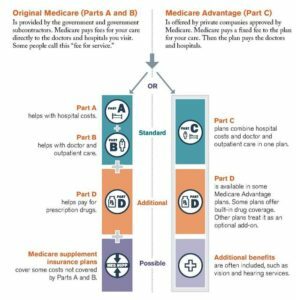 Your first option being on Medicare is just to stick with Original Medicare Parts A + B. This is what I like to call “Basic Medicare” and everyone on Medicare has at the minimum, Parts A + B. For most folks, Part A is “free”, as in, they already paid for it by working for at least 10 years and paying Medicare taxes. Part B, however, starts at about $134 per month. This increases based on your income. For most folks on just Original Medicare and no plan or supplement, they will pay about $134 per month. Original Medicare covers about 80% of all medical costs. If you choose not to get a plan or supplement you may see some large bills if something unexpected happens. Last time I checked, we live in a free county so you can choose to go with or without a plan just please remember; there is no out-of-pocket limit if you just have Medicare and no supplement plan! The next option for your Medicare is to have Original Medicare + a Medicare supplement (also known as a Medigap plan). There are 10 Medigap plans to choose from, they are identified as a letter, plans A-N. With this type of Medicare plan, you can see any doctor, specialist, hospital, etc that accepts Medicare, anywhere in the country. There are no, networks or referrals needed. Generally, this type of plans is best for someone who travels or who don’t mind paying a bit more in premium (vs. a Medicare Advantage Plan) for the freedom to see any doctor they please. California has a unique law that allows you to change your Medigap plan regardless of health, once per year. We represent all of the Medicare supplement plans and carriers in San Diego. Please, call us for more information. You can read more about Medicare Supplement Plans in San Diego here. Medicare Advantage plans are yet, another option to go along with Original Medicare. Refereed to as “Medicare Part C” because they combine Original Medicare together with a secondary insurance plan. Medicare Advantage plans in San Diego are quite popular because there is a great selection of plans to choose from. You have the choice of a PPO or HMO plan. Typically, Medicare Advantage plans combine your prescription coverage and Medicare coverage together into one plan. In addition, many Medicare Advantage Plans in San Diego offer dental, vision, chiropractic and even transportation benefits. 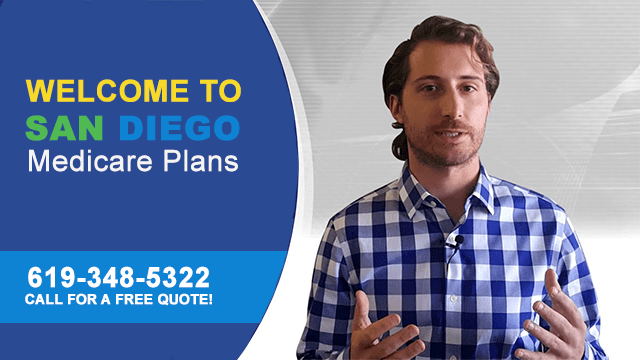 There are over 25 different Medicare Advantage Plans in San Diego and many are $0 premium plans, meaning you only have to pay your Medicare Part B Premium and the co-pay for an office visit or other out-of-pocket expenses that go along with the plan. Advantage Plans are a great fit for a lot of folks in San Diego, but not everyone! Unfortunate, they are often oversold by agents and companies because they generate the most commission and are the easiest to sell (“$0 premium Mr. Jones just sign here”). There are many important factors that must be considered when deciding if an Advantage plan is the right choice for you. Call us for a free consultation to find out what the best Medicare insurance options are for your unique situation. You can read more information about Medicare Advantage Plans here. Medicare Part D refers to prescription coverage. Part D plans are offered by private insurance companies and help cover the high cost of RX drugs. There are many different prescription plans available in San Diego, and they change every year. Because each plan covers drugs differently, the best drug plan is always 100% based on the exact prescriptions you take. Selecting the wrong plan can end up costing you thousands of dollars out-of-pocket. Drug plans can range in premium between $18 – $100 per month, this may not include the co-payments made at the pharmacy. When you enroll onto Medicare you have an enrollment window to purchase a drug plan. If you don’t get a plan when you are first eligible you will be subject to a late penalty that you will have to pay each month, indefinitely. By working with me, you can rest knowing you will have the best drug plans presented to you based on your unique situation.